TheRustedChain - The Blog: My dog ate a TV reporter. My dog ate a TV reporter. Yesterday I got a call from a local TV station that they wanted to do a story on The Rusted Chain necklaces we're using as a fundraiser. They would be out in an hour. When they arrived, we were in the driveway making our introductions and I looked down to see that Sully, our big Bernese Mountain Dog, had half a mouse in his mouth. Just the tail sticking out between his teeth. I distracted the reporter and cameraman while whispering to The Man, "A MOUSE!! A MOUSE! Disgusting!!" We went inside to the jewelry studio and started the interview and filming. Then the reporter stepped outside to go back to their truck for something. We continued to work and the cameraman continued to film. For a long time. A really really long time. I kept thinking, "I wonder where she went?! Is she wandering around our property?" Finally she came back and told us that Sully had been guarding the front door. He wouldn't let her back in the house!! He just laid there and when she'd reach for the handle, he'd growl at her. A worker that happened to be outside working on a building of our's came over and helped her get back in. After the TV crew left, Sully went to the field near us and rolled in fresh cow poop. Needless to say, he was not my favorite dog of the day. Anyhoo.... KAKE-tv did run the story last night. I haven't blogged it yet, but it's been posted on Facebook and Twitter. 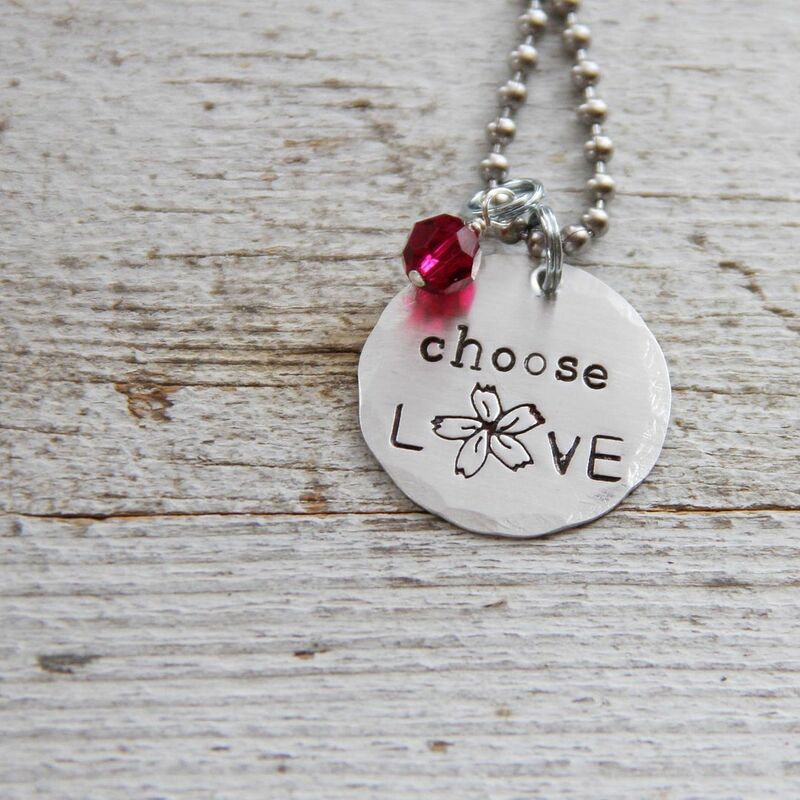 We're donating $10 from each CHOOSE LOVE necklace to 8 year old Boston victim Martin Richard's family. It has been a huge success so far and I'm so humbled by the outpouring of support!! Click the image below to find the necklaces. CLICK HERE to see the video of our story. I watched the video and kept thinking of the reporter not being able to get back in the house :) Also, it was funny that the ad that came up first was about a tour to the PNW - where I live! It's a wonderful thing you are doing. Am SO glad I watched the news and learned about you! So impressed and inspired by your works of art. Thank you! Watched from India :) lovely to see you and all your great work!